This is a tricky review to write. On one hand, I thoroughly enjoyed Wife 22 – Melanie Gideon is funny. I like her writing style. But (and there’s always a but) the plot was ridiculous and by the end, I just couldn’t overlook that fact. Wife 22 is the story of Alice Buckle, a 40-something woman, wife and mother, drama teacher and Facebook chatter and Googler of solutions. Alice decides to take part in an online survey called “Marriage in the 21st Century”. She’s assigned a pseudonym (Wife 22) and a caseworker (Researcher 101) and before long she finds herself revealing her innermost thoughts to a complete stranger. I use Twitter to make a note of what I’m currently #reading. I mentioned that I was finding Melanie Gideon’s Wife 22 an interesting read. 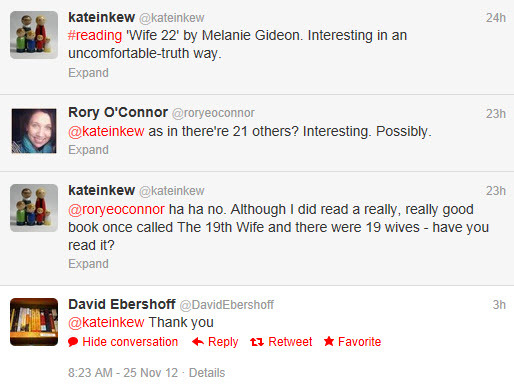 Rory from Fourth Street Review chimed in… And then David Ebershoff, author of The 19th Wife piped up. Little, chance interactions. And this is why I love Twitter. PS. As I said, The 19th Wife is a really interesting book (but not related to Wife 22 in any way, shape or form).